We have two red-eared slider turtles. For most of the year they live in our living room in a big aquarium, but for the winter they have to go into hibernation. As the winter approaches, the light and temperature in the aquarium has to be reduced, and then around the beginning of December they have to go into complete darkness, at about 10C. Last year we tried putting them into the cellar: our cellar was too cold (went down to just +1C, could have frozen…), my girlfriends parents cellar was too warm, and in the end our neighbours cellar had about the right temperature… but a lot of bother. So this year I thought I’d find a technical solution. styrofoam and spray foam around a storage box to make a really well insulated box for the turtles. Two CPU water cooling blocks sandwiching a Peltier element (thermoelectric heat pump). 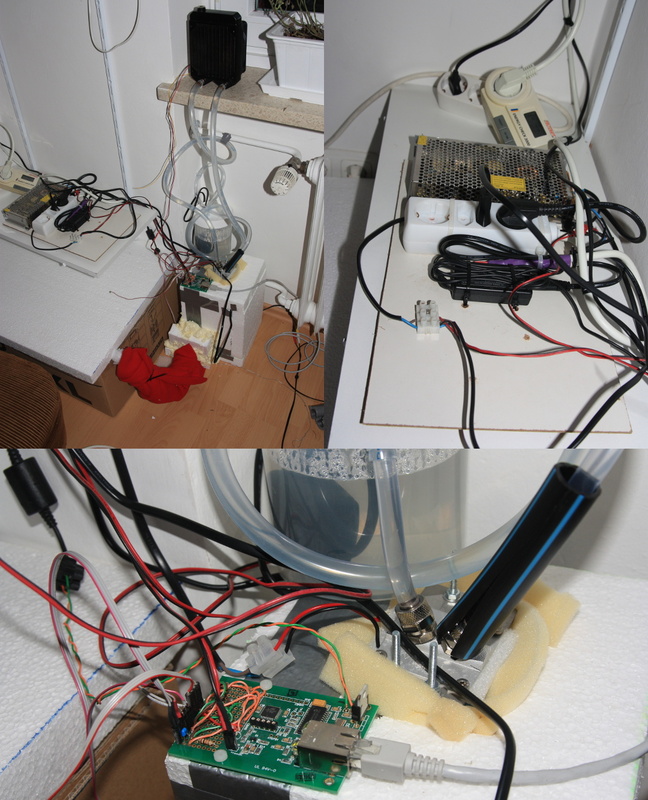 A networked atmega processor to read the values from two thermometers (one in the cool water cycle, one in the turtle box), and turn the pumps and peltier element on and off. A Perl script to control it! When I’ve got the logic and parameters worked out, I’m going to translate the logic of the Perl script to C and load it onto the atmega processor, but for starters Perl is a great helper because I can quickly prototype, try out and refine without having to recompile, and to be honest… I just don’t really like C as much.